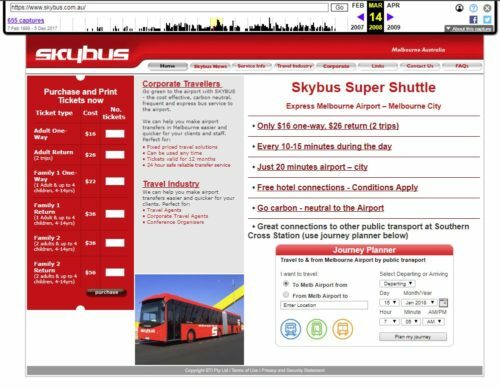 There was once a time when SkyBus would whisk you from the Melbourne CBD to the airport in just 20 minutes – but thanks to traffic congestion and a lack of bus priority, that is now a distant memory. So what went wrong? As late as 2008 the 20 minute travel time was front and centre on the SkyBus website front page. By 2010 the 20 minute reference was dropped from the front page, but still appeared on their FAQ page. There it remained through 2012, 2014 and 2015 – but with the addition of an asterisk – “times may vary due to traffic conditions”. By 2016 the SkyBus FAQ admitted that travel times had blown out by 50% in peak periods, to 30 minutes. And by 2017 it had blown out further – 30 minutes the best case scenario, with a 45 minute journey expected in peak periods. My recent SkyBus trip took 50 minutes to travel from Southern Cross Station to the airport. Why is SkyBus taking longer? The short answer – traffic congestion. 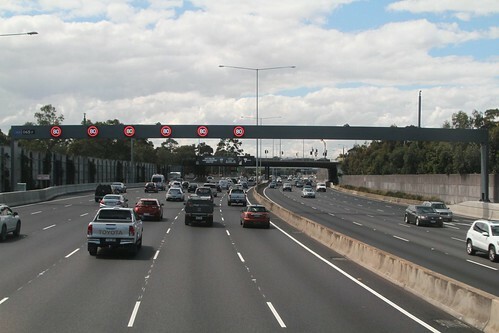 During the 2000s upgrade of the Tullamarine Freeway as part of the CityLink project, an ‘express lane’ for buses and taxis was added between Flemington Road and Bulla Road, operating between 6:30 am and 9:30 am inbound and 3:30pm and 6:30pm outbound, weekdays only. A study by engineering and consulting firm Parsons Brinckerhoff found that “the future will see a continuation of the significant but relatively gradual degradation of travel time on the CBD-airport bus route”. 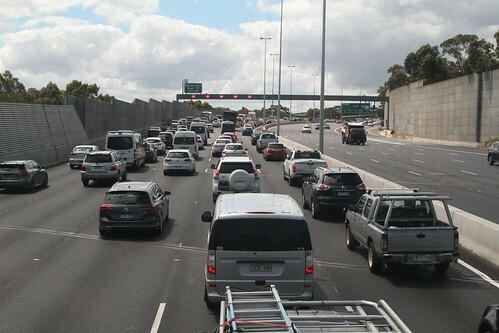 The study provided three options for improving travel times, with the department’s preferred one involving creating an express bus lane and putting SkyBus on a public transport fare. The SkyBus lane would be created relatively cheaply by removing the emergency lane and nominally narrowing the other lanes. Despite the “no plans to widen CityLink” line, what did the government decide to do a few short years later? More roads, of course! 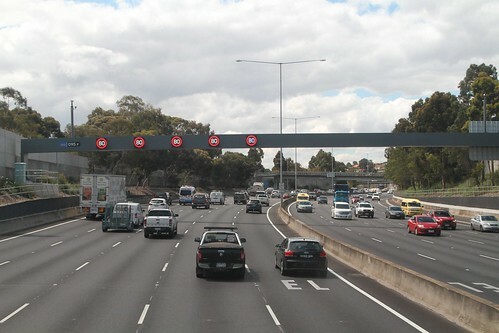 Approval for the CityLink Tulla Widening project was given in 2015, adding an extra lane to the Tullamarine Freeway between Melbourne and the airport, at a cost of $1.3 billion. 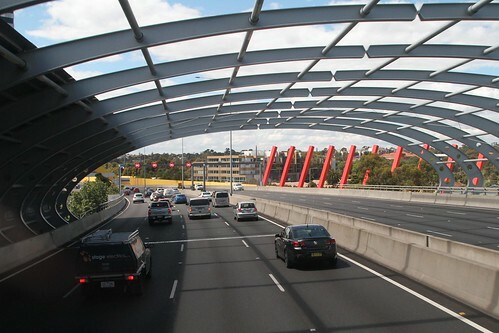 The section of elevated viaduct opened by CityLink in the 2000s as the ‘Western Link’ has had the emergency lanes removed and the speed limit dropped to 80 km/h, allowing an extra traffic lane to be squeezed in. 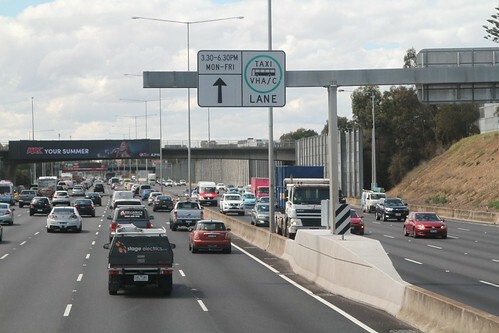 An additional lane has also been added to the five lane section north of Flemington Road. As well as the four lane section north of Moreland Road. But on the bus priority front, nothing has changed, despite the addition of a new lane for general traffic – limited operating times, no enforcement when it is active. And it still comes to an end at Bulla Road – only half way to the airport! And to make matters worse, there are no emergency lanes on the upgraded section of freeway. 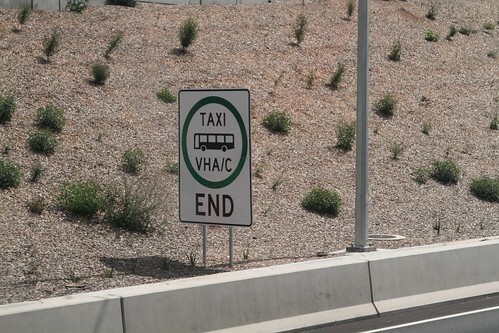 Broken down taxis are a common sight on the Tullamarine Freeway. As are rear end crashes. Today a mere inconvenience, but without emergency lanes any minor incident will result in an entire traffic lane being closed down. $1.3 billion well spent? An addendum perhaps worth noting (but I cbf finding sources): I remember stories in the press saying that the proposed Melbourne Airport train would take 25 minutes via the preferred Sunshine route, and people were complaining at the time that it wouldn’t be worth it if it ran more slowly than the SkyBus. The assumption underpinning this opinion was obviously that the bus would still take 20 minutes. Thanks to all the induced demand and lack of priority, it’s now much more time competitive. The main argument now undermining any airport train is frequency compared to SkyBus. High frequency public transport is the answer not roads. Politicians have even said it themselves that if you provide a high frequency service people will use it. Good summary. I’m a Skybus fan but tbh haven’t used it for a few years and didn’t realise how bad things had got!! dedicated lane is an urgent priority. 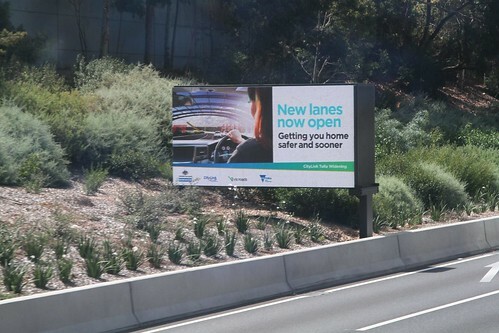 I’m not sure whetehr to be more furious at transurban or our dismal government that is so in thrall to them. 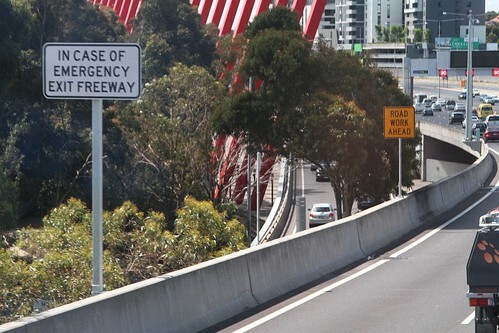 You don’t need Emergency Lanes on a modern managed road as the freeway management system shuts a lane to create one when required. About time people stop reporting on this as it’s a non issue. Transit lanes on the other hand would have been good as the third lane during peak periods all the way to the airport. The system creates an emergency lane as required, but it does mean you lost a lane to normal traffic, forcing traffic to merge on the approach. The real question – is it worth losing a lane when someone breaks down, if you get an extra lane when traffic is flowing normally? In an ideal world, with a bottomless pit of money, then all freeways should have dedicated emergency stopping lanes. 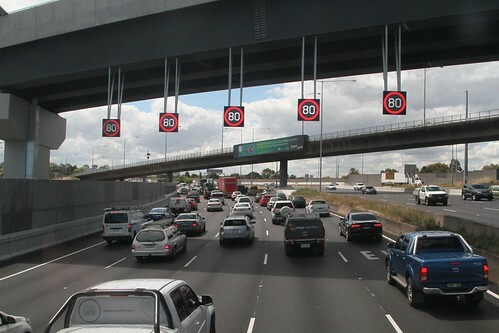 However, it would be interesting to see figures related to how many break-downs occur on the CityLink section of the Tullamarine Freeway per week in order to see how often an emergency stopping lane would genuinely be used. If it’s just one or two a week (which may not be in peak time), then if it’s a choice between an extra traffic lane open 24 hours a day, or an dedicated emergency stopping lane to guarantee no traffic disruption, then when weighing things up, you could get away without the emergency stopping lane. Emergency stopping lanes also tend to be used by people for things other than emergencies, like taking phone calls on the road, getting one’s bearings, taking a short break, etc. Even genuine emergencies, like flat tyres, are usually things that don’t happen instantly, so you could get off the freeway to attend to them. Bus/ VHA priority lanes have never been followed by normal drivers, nor as far as I can tell even been policed. Priority lanes in name only. One wonders if Citylink asked for them not to be enforced. And where is this airport rail link that the governments of this country have been talking about for decades? Such a joke for city like Melbourne not to have an airport rail link.